Tick Talk » The highest quality money can buy. The highest quality money can buy. 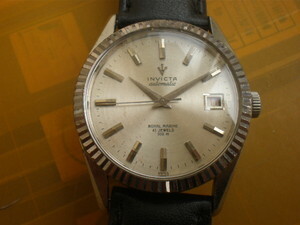 Today I was working on a nice vintage watch made by Invicta (similar to the one on the left). It is an automatic with date. The dial is proudly marked 41 Jewels. Now, with 41 jewels you expect this to be a really nice movement jeweled all the way to the barrel. Maybe the barrel itself is even jeweled. Your standard automatic has around 25 jewels. A really nice automatic might have 31 jewels, but 41 jewels! That must be a nice watch. Inside the watch has the A. Schild Caliber 1702/1 with 25 jewels and . . . 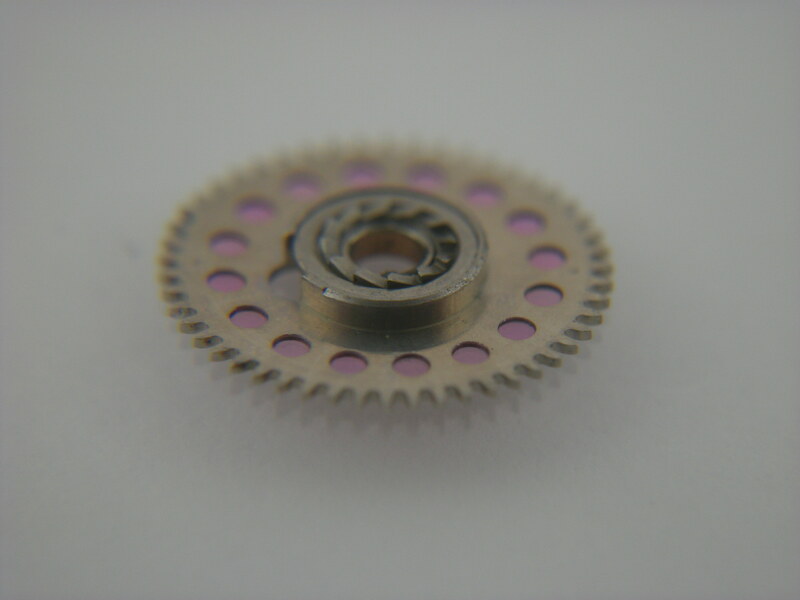 This driving wheel for the barrel with 16 ruby jewels. Not one of these jewels even protrudes from the wheel far enough to contact anything. Completely useless! Now that’s quality! The thing is, it really is a decent watch, even with only 25 useful jewels. They should have just labeled it 25 jewels. This entry was written by Jordan Ficklin and posted on May 1, 2012 at 7:23 pm and filed under watches, watchmaking. Bookmark the permalink. Follow any comments here with the RSS feed for this post. Post a comment or leave a trackback: Trackback URL. Despite I have read some time ago about this practice, I must admit I have never come across one of these watches. It is hilarious what marketing can do! If you Google ISO 1112, you’ll find the standard regarding functional and non-functional jewels. Here is another very interesting article regarding this subject. I have one like this! 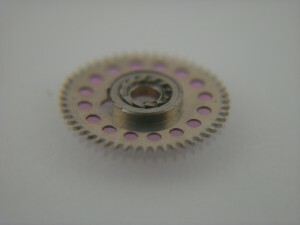 The dial says “Carlo Automatic Superflat” and it has two driving wheels stuffed with red jewels. I’ve never been able to find out anything about it. this is really funny! just to increase the amount of jewels and probably con the buyer into thinking more jewels, better quality. well after all it is an invicta! !